​You must complete the online Precourse Self-Assessment prior to attending course. Approximately 3 hours to complete, including skills practice and skills testing. ACLS Renewal is a credentialed course. Providers who successfully complete the ACLS course receive a course completion card valid for two years. 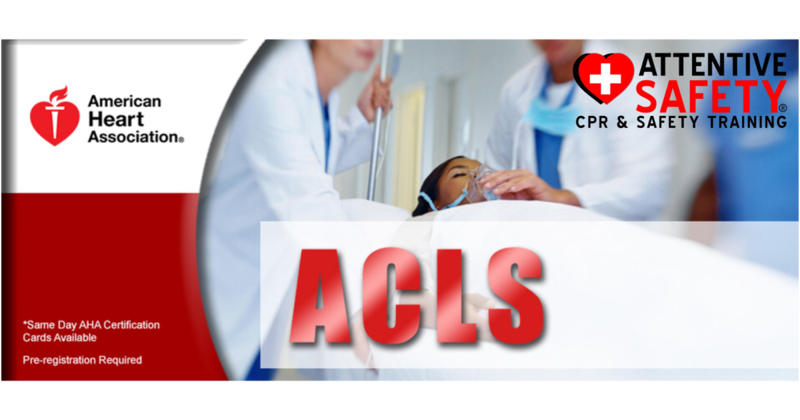 ​​Attentive Safety CPR and Safety Training's ACLS Renewal Course is for current ACLS providers who need to renew their ACLS skills and ACLS Provider course completion card. The ACLS Renewal course builds on the foundation of lifesaving Basic Life Support (BLS) for Healthcare Providers skills, emphasizing the importance of continuous, high-quality CPR. This advanced course highlights the importance of team dynamics and communication, systems of care, and immediate post-cardiac arrest care. ACLS Renewal also covers airway management and related pharmacology. ​​Science of Resuscitation: A high level overview of the entire class, and discussion of updated guidelines. Airway Management: Basic and Advanced airway management skills including the use of Waveform Capnography. Technology Review: Learning how to use monitor functions such as: defibrillation, synchronized cardioversion, and pacing. Team Dynamics: Contrasting bad and good team behaviors, and discussing priorities of team members. Complete the Precourse Preparation Checklist that came with your ACLS Provider Manual. Bring the checklist with you to the course. Review and understand the information in your ACLS Provider Manual. Pay particular attention to the cases in Part 5. Ensure that your BLS skills and knowledge are current for the resuscitation scenarios. You will be tested on adult high-quality BLS skills at the beginning of the ACLS Course. You must know this in advance because you will not be taught how to do CPR or use an AED. Review, understand, and complete the Precourse Self-Assessment (mandatory) on the Student Website (www.heart.org/eccstudent). You will find the code to access the student website at the beginning of the ACLS Provider Manual. You will not be taught how to read or interpret ECGs in the course, nor will you be taught details about pharmacology. Who Needs ACLS Provider Certification? Attentive Safety CPR and Safety Training's ACLS Provider classes are for healthcare providers who work in the management of cardiopulmonary arrest or other cardiovascular emergencies. These requirements are driven by state licensing board regulations and detail which particular healthcare agencies or individual healthcare license holders that are required to maintain ACLS Provider certification. This class can also be taken by medical professionals or students in a medical program who are interested in expanding their knowledge. Attentive Safety CPR and Safety Training is now able to offer Continuing Education credits through CAPCE (Commission on Accreditation for Pre-Hospital Continuing Education) for EMS professionals. This continuing education activity is approved by the American Heart Association, an organization accredited by the Commission on Accreditation for Pre-Hospital Continuing Education (CAPCE), for 2.25 Basic CEHs, activity number 18-AMHA-F2-0001.